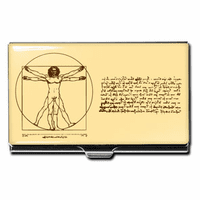 Help you favorite physician or medical professional keep their pen and business cards handy with this medical theme card holder and pen stand desk set. 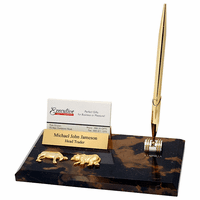 Made from genuine black marble, with unique bronze veins running through it, it holds up to fifteen standard business cards. 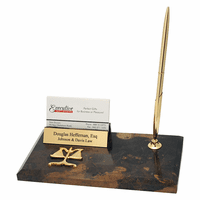 It has a pen stand and a smooth writing ballpoint pen is included. A Caduceus emblem, the ancient Greek symbol of modern medicine, is attached to the front. The emblem and the appointmen's are all made of polished brass. 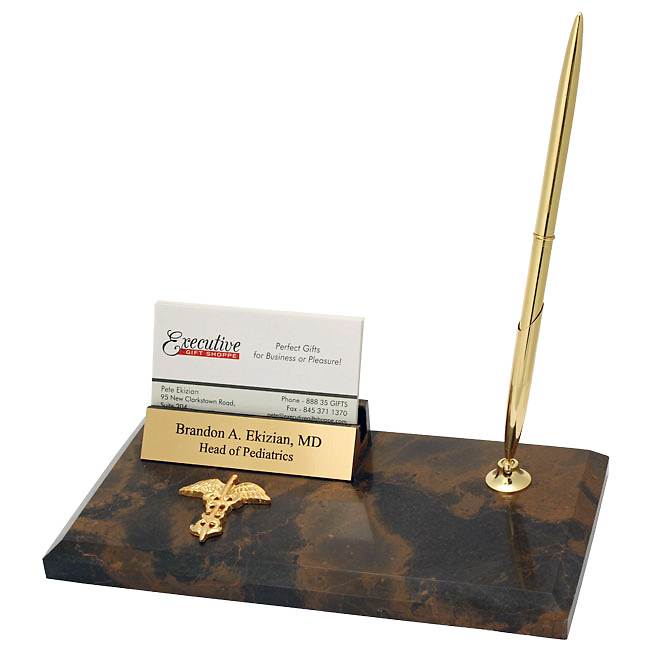 Add a laser engraved plate in front of the pen stand free of charge, turning this desk set into a personalized gift your favorite doctor or nurse will treasure. Can you tell me the size of cartridge the pen takes? It takes a standard ballpoint pen refill. I expected better finishing in this product with being so expensive. The medical logo looks cheap, glue work isn't well done anywhere. Merchant Response:We're so sorry you're unhappy with this item, it is usually very well received. We'd be happy to ship you a new one free of charge. 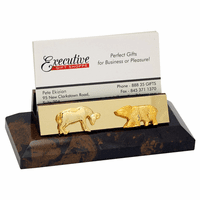 If you'd like us to, email us at help@executivegiftshoppe.com with your order # or email. Thanks!